GCU students celebrate after their teams finished 1-2 in the university division of the Stock Market Challenge on Thursday night in Scottsdale. From left: George Williams, Gabrielle Unruh, Eli Miller, Dominic Russo, Morgan Zerwas, Damin Pilon, Benjamin Sobek, Jordan Sieben. The just completed Money Week at Grand Canyon University was all about financial literacy, creating good financial habits and putting students in touch with financial professionals. The events were packed, both with information and, more importantly, students. Then a group of eight Colangelo College of Business students showed Thursday night that they’re more than just financially literate – they’ve got a good read on how to apply it. For the third straight year, GCU was the winner of the university division in the Stock Market Challenge, which raises money for Junior Achievement of Arizona. In fact, the two four-person teams from the University finished 1-2. The Scottsdale event condenses two years of typical stock market fluctuations – such as President Trump announcing a tariff on steel or the market taking a sudden downturn – into two hours, and teams of college students and industry professionals react to the news by buying or selling make-believe stocks. 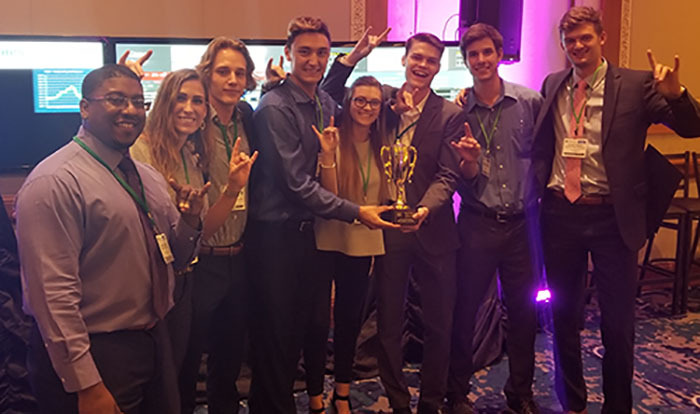 GCU’s Cash Cow team, with Damon Pilon, Eli Miller, Benjamin Sobek and Morgan Zerwas, increased its portfolio by nearly 80 percent and also finished in the top 10 overall in a competition that included about 50 teams of professionals. The Colangelopes, with Jordan Sieben, Dominic Russo, George Williams and Gabrielle Unruh, finished second. They merged their talents well, even though only half of them even knew each other when they started preparing a month ago. That’s not a lot of time to build a team, but that’s what happened. What Jacobson likes best about the competition is the educational aspect and how it gives students a glimpse of what the industry is all about. The meetings to prepare for the Challenge simply were an extension of their regular coursework. When Jacobson debriefed them at the end of the Challenge, he wasn’t surprised to hear that it moved faster than they expected. “I like the fact that they have to use their heads, they have to be thinking on their feet,” he said. “We’re trying to teach financial literacy, and part of it is saving for retirement, investing, knowing how it works, knowing the intricacies. The Challenge is sponsored by some of the same companies that frequently come to campus to recruit. Now the students get to compete against those industry professionals. And while most of the GCU students competing this year had never done it before, it’s not as if they’re unfamiliar with the stock market. Pilon, for example, is president of the Finance/Economics Club and has been dabbling in stocks since he was 13. He was playing the Guitar Hero video game one day and wondered who owns it. Before long, he had bought stock in Activision. He had a good teacher at home: His mother, Jennifer Pilon, teaches finance at The College of St. Scholastica in Duluth, Minn.
“She’s always emphasized using your money to make more money,” he said. CCOB Dean Dr. Randy Gibb saw it as the perfect conclusion to a stretch that has included a number of significant events for students. The list of recent speakers includes Dan Bachus, Chief Financial Officer of Grand Canyon Education, and members of the Arizona insurance industry talking about blockchain, and then Money Week has featured a financial career services panel with representatives from Vanguard, Merrill Lynch, Schwab; a Home Buyer Prep event; and a Financial Literacy event hosted by the Strategic Employer Initiatives and Internships team. The official CCOB tally is that nearly 2,000 students participated in Money Week. And then there were the eight at the Stock Market Challenge. Ultimately, though, it’s all about future jobs. Maybe GCU could win both divisions – the universities as well as the professionals. That would make this even more of a win-win.